The construction of the windfarm started in April 2012 with the building of access roads, hardstandings and turbine foundations. Turbine components started being brought into the site in September 2012 and construction of the wind turbines was completed in October 2013. 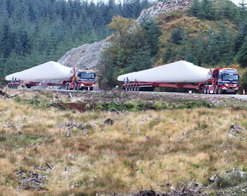 The West Loch Awe Timber Route (WLATHR) was the key to the construction of Carraig Gheal Wind Farm. The wind farm shares the WLATHR for operation, maintenance and ultimately, decommissioning with Forestry Commission Scotland. See the link on the right for more information about WLATHR.